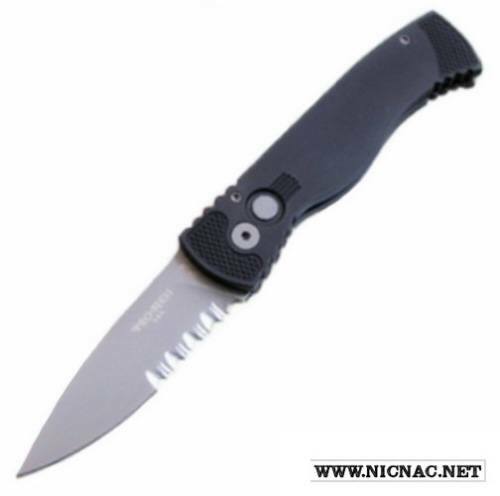 Protechs TR (tactical response) knives are all business. The Protech TR series of knives are all made of the highest quality materials available, manufactured and assembled painstakingly to produce a factory production knife with the tolerances of a custom made knife costing hundreds more. Rest assured that your Protech Tr knife will rise to any challenge put before it. As with all Protech Knives, the TR series carries a limited lifetime warranty and Dave, the founder and owner of Protech Knives, personally stands behind every Protech knife made.Specs: Overall: 7.6", Drop Point Blade: 3.0" x 0.120" thick, 59RC, Handle: 4.5" x 0.44" thick, Weight: 3.3 oz.